These are delicious as a snack or served as a special dessert with a delicious cinnamon peach topping. Use a mini cheesecake pan or in a pinch, a standard muffin tin to bake these cheesecakes. The great thing about a mini cheesecake pan is its removable bottom, which makes it extremely convenient. Heat oven to 350 F. Lightly spray a mini cheesecake pan with baking spray or line a standard muffin pan with foil liners or double paper liners. Combine graham crackers with brown sugar and melted butter. Pat into the bottom of lined muffin cups or mini cheesecake pans, about 1 1/2 tablespoons in each cup. A small glass bottom or pestle will make tamping easier. Bake for 6 minutes; set aside. Drain peach slices; reserve syrup. Thinly slice the peach slices crosswise. Put about 1 to 2 teaspoons peach slices into each ​​​baked graham cracker crust. Beat cream cheese until fluffy; beat in 1/3 cup sugar, flour, and eggs, then beat in 1/3 cup reserved syrup and the vanilla just until blended. 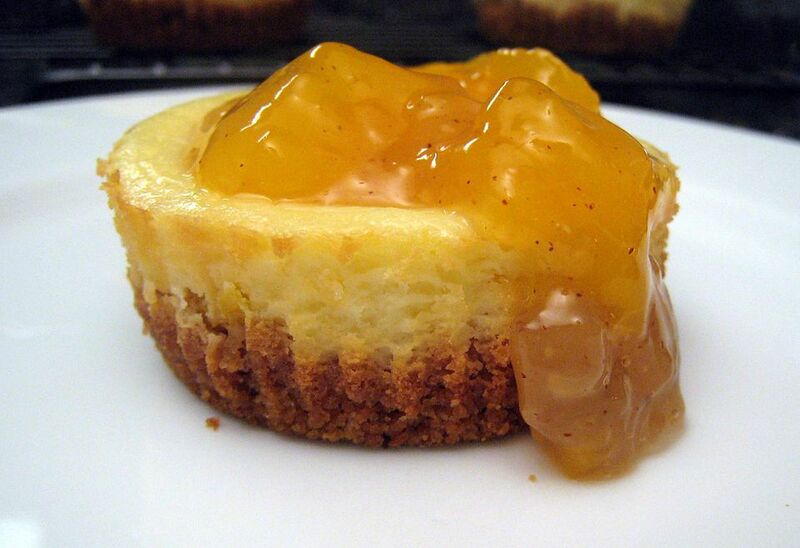 Spoon about 1 1/2 tablespoons of the cream cheese mixture over peach slices in each muffin cup or mini cheesecake cup. Top with a few more peach slices. Bake for 20 to 25 minutes, or until set. Meanwhile, if desired, make a sauce with remaining syrup and sliced peaches. In a saucepan, combine about 1/2 cup reserved syrup with cornstarch; whisk in 1/4 cup brown sugar. Stir in remaining sliced peaches and cinnamon. Cool cheesecakes in pan on a rack; then refrigerate to chill thoroughly. Remove from the mini cheesecake cups or muffin cups. Serve as is or with a teaspoonful of cinnamon peach topping.